DUBUQUE — In his homily at a Mass com­memorating the 75th anniversary of the Pearl Harbor attack and the death of Chaplain Aloysius Schmitt, Father Dennis Miller pointed out two important dates in the life of the priest, whose remains are now buried near the main altar in Christ the King Chapel. “He died on Dec. 7 and was ordained on Dec. 8,” said Father Miller, the chaplain for Loras College. 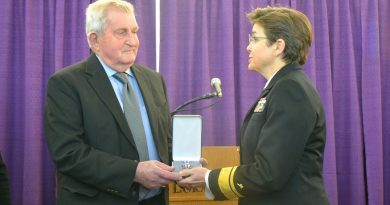 Father Schmitt, an alumnus of Loras, made the choice to sacrifice his life for Christ on his ordination day, and then again when he helped sailors escape the sinking USS Oklahoma, Father Miller reflected. The chaplain was unable to fit through a small porthole that he had used to push others out to safety. Witnesses reported that “God bless you” were his last words, Father Miller said. In his remarks, the priest later linked Chaplain Schmitt to the humility and sacrifice of Mary. The inclusion of Mary was fitting since the remembrance Mass, which brought veterans, active duty military personnel, Loras students, Knights of Columbus and many others together, was held Dec. 7 — the day before the Feast of the Immaculate Conception. “I think it was divine providence that (Chaplain Schmitt) died on Dec. 7 and was ordained on Dec. 8,” reflected Mike DeMoully, a member of Knights of Columbus Council 15813 of St. Columbkille Parish in Dubuque, after the event. 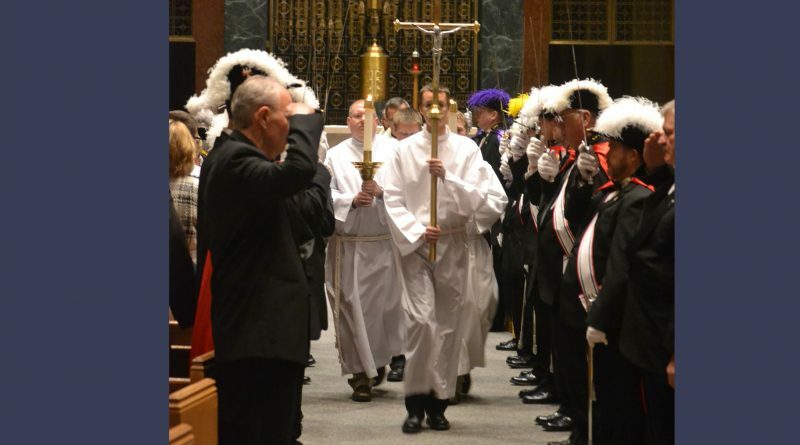 The Mass was organized by members of the Chaplain Schmitt Assembly, a fourth de­gree Knights organization established in 2015. This group worked with Loras College’s Knights Council, other students and clergy to plan the liturgy. They are hoping to make it an annual event. Father Schmitt, the first chaplain to die in World War II, went down with his ship in 1941. His remains were unidentified until earlier this year when the U.S. military used DNA identification technology on the bodies of crewmembers from the ship recovered from the bottom of the harbor. 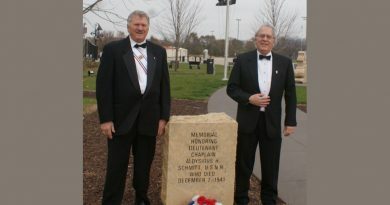 A vigil and funeral Mass were held Oct.7-8 at Loras when the chaplain’s remains came back to Iowa. They are now buried in the chapel which was built in his ­honor. The most recent Mass on Dec. 7 was concelebrated by Fathers Miller, William Joensen and Hilary Aidoo. Members of Chaplain Schmitt’s family also attended the latest Mass. “We’re going to present a flag to a family member that wasn’t there in October,” said Gary Kircher, commander of American Legion Post 6 in Dubuque. Kircher said it was important for him and other veterans to be at the Mass because service to the country links people across generations. “I had five uncles that were in World War II …Whether you served 75 years ago or today it’s the same thing,” he said. 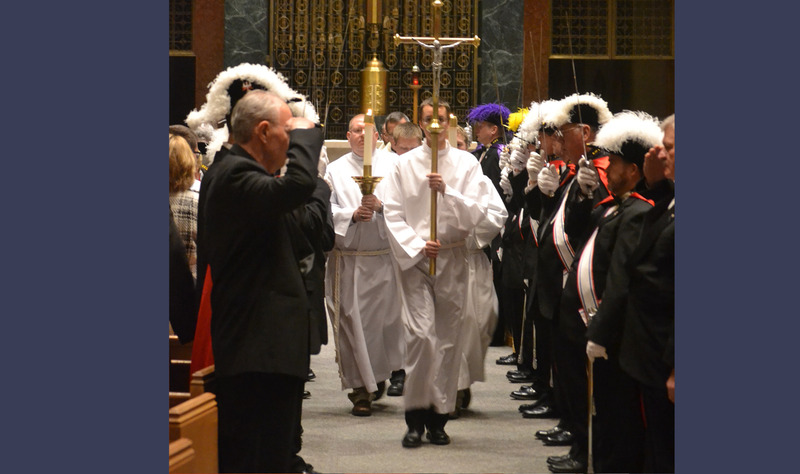 Members of the Knights of Columbus Council 510, Council 4215 of St. Joseph the Worker Parish and the Dubourg Assembly 1573 of Peosta also participated in the Mass. “A lot of men died (at Pearl Harbor) for our freedom today,” said Mike Loomis, grand knight for Council 510. Students from Loras acted as lectors, and eucharistic ministers and provided the music. Seminarians for the Archdiocese of Dubuque who study at St. Pius X Seminary on Loras College’s campus were altar servers. Student Kenzie Elsbernd, a native of Ossian — a community close to the town of St. Lucas where Chaplain Schmitt grew up — serves as the grand knight of the Loras College Knights Council 9224. Father Schmitt’s spirit of service, which is embodied in the college’s motto, “For God and Country,” is alive on campus, according to Elsbernd.